I am continually amazed at the great lengths I am willing to go in order to ice and mixed climb! With the multi billion dollar project/job cruising along at 55-60 hours/week, Doug and I (still)drove up to Lillooet after work Friday evening in rain and Seattle traffic, and picked off 2 classic routes on Saturday and Sunday. Then, back in time for another long Monday push at work. Damn I am tired, but happy to still have some capacity similar to when I was younger! The 1st edition cover photo for West Coast Guide shows a pretty pitch named Capricorn. I had always wanted to do it, but was put off by the long approach. It was worth the slog however, though we messed up the approach. It is easy to accidentally start to far lookers right of the true approach. The main pitch/crux was steep at the top and wouldn’t have been that tough were it not for chandeliered conditions. The main reason for going to all the trouble of driving hour after hour was to take a shot at a very new mixed route that seemed to be my type of climb. 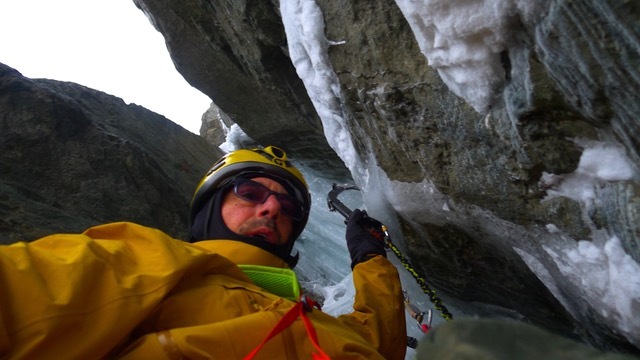 The rating for Bitcoin Billionaire intimidated after getting humbled in the Canadian Rockies by similarly rated mixed climbs, but the route has a more alpine feel, and the rating shouldn’t scare off many aspirants. The highlights are the scritchey first pitch, 2 mixed chimneys with fun moves, and a satisfying wi4 finish. The setting is great, views and solitude lend a remote feel. It worked out to simo a few of the steps in the middle, and combine pitches. We placed a dozen rock pieces, and stretched the ropes out in 5 pitches. Nice day out to be striving for adventure! Thanks to Doug, Jenn, Caroline, and the BB FA team for putting out the good times! Lillooet British Columbia Canada. is a small blue-collar town that was at one time popular with ice climbers, and may soon be again thanks to internet stoke. I used to go there often in my younger days, and I hope to more in the future! Scroll past crappy pictures for account of the first ascent! After working on the Bridge River for the last 3 years and over spending over 100 plus days working on fisheries conservation and monitoring with the Xwisten First Nations, I’ve spent a lot of time day dreaming of establishing new lines in the Bridge River Valley, as it’s a very special place for me. Over the last few months, I’ve been watching a few lines form high on the walls above the river. After showing Steve and Hunter these lines, we decided to give one of the lines a go! and I, established a new and exciting mixed alpine style route up the Bridge River Valley called “Bitcoin Billionaire, M6, WI4, 325m”. The route was completed in 7 Pitches, approximately 43.5 km from the highway from Lillooet or 6.5 km below Terzaghi Dam. The route lies between the already established routes Salmon Stakes and A New Leash on Life” along the highway on the east side of the river. From the road you can only see the final pitch of beautiful fat blue grade 4 ice. Cross the river and gain approximately 250 of elevation to the base of the climb. The route is a approximately 550-600m elevation of gain, from the base of the river to the top of the climb, the route itself is approximately 325m. Steve Janes says one of the best lines he’s ever climbed. Pitch 1 55m WI 4: Climb a small hanging pillar to thin ice for approxmently 25m WI4, the pitch than eases up to grade 2-3 and snow to a large ledge with tree belay. Pitch 2: 55m M6: Climb grade 2-3 and snow 25m to gain the ledge. Traverse into an awkward and fun squeeze chimney with questionable pro, requiring making multiple crux moves involving lots of stemming, groveling, facing both directions, and knifeblades (M6, 25m). Traverse right 5m to and belay off large tree on lookers right. Pitch 3: 65m WI 2/ M3 / Snow Ramp: Climb the long snow ramp 45m, then climb awkward 2-3/M3 for 10m, climb the remaining snowslope 10m to large tree on lookers left. Belay from tree. 70m ropes are required or belayer may have to simo climb to 10m or to small tree on lookers left to establish another belay station. Pitch 4: 35m WI 2/Snow Ramp: Round corner from belay station on easy grade 2 and snow. Make one awkward move over rock and ice bulge to base of squeeze chimney. Belay is located on lookers right in small crack, gear to 0.5 or pins. Pitch 5: 55m M6: Enter the chimney and get busy! Stem up on thin ice and rock to overhanging chalkstone roof M6 (Solid cam under roof, right side #2 Yellow BD). Then find stick in low quality snow and ice at the lip and grunt through the roof. Once through the roof and chalk stone enjoy fun stemming and better ice M5 to upper cirque and final tiers. Belay off good ice screws below upper cirque. Pitch 6: 20m WI 2: Easy climbing on good ice to base of final 40m tier. Belay off good ice screws on lookers right in small alcove. Pitch 7: 40m WI 4: Fun climbing on grade 4 on fat blue ice to top of climb. Belay off good ice. Decent: Rappel route, using trees, v-treads and slinging ice pillars.